Maybe the most familiar-feeling new country I’ve ever visited. Seoul had been near the top of my “places to go” list for nearly a decade and I finally went for the first time in October 2018. While it made me feel like I’ve been there before, there still were a few surprises that would’ve been nice to know before. NOTE: Seoul has amazing food. If you’re looking for food recommendations, skip to the bottom! It was my first time in Korea, so I was surprised that I felt almost as if I had been there before. Having lived in Japan and the US, being in Seoul felt somewhere in between the two. It’s very much its own country of course, but I never felt lost or like everything was so foreign to me. Like much of America, the city has wide streets and their cars drive on the right side of the road. It has clean trains, modern lights and buildings along with really local, street-style eateries like Japan. Getting around in English is fine most of the time, and the convenience stores could rival their Japanese counterparts. Even spicy, fried chicken wings with beer is a thing. Not so different at all! 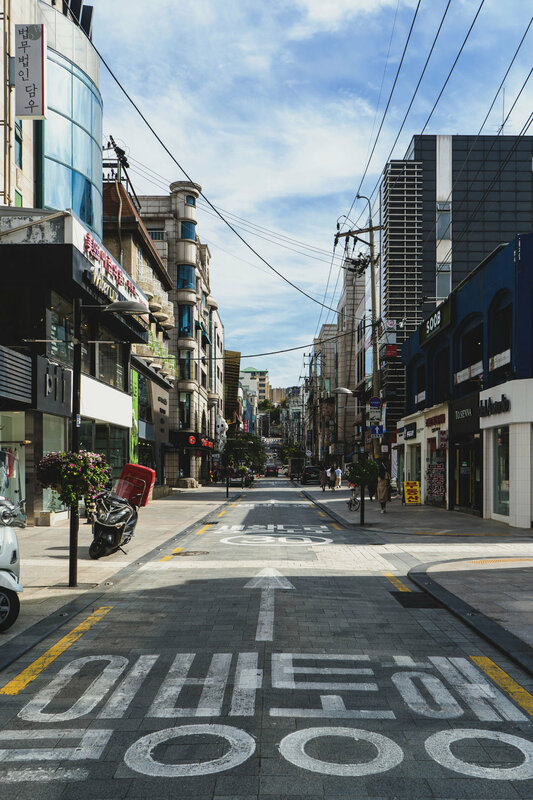 The Myeongdong area is geared slightly towards the younger crowd and has a lot of shopping with shops for skincare, trendy fashion brands and even lookalike knockoffs. The abundance of lights and street food vendors make it a lively place until around 11PM. We actually went to Myeongdong three times during our stay; once for a delicious oxtail soup lunch at Sinseon Seolleongtang (information at the bottom) and the other two times at night. A lot of the street foods looked good, but being so full from all the other good food, I was only able to try a frozen s’more - a torched marshmallow with ice cream inside. Thumbs up. From Myeongdong, we caught the light blue line and transferred to the orange line at Chungmuro station and went to Gyeongokgung station for the Gyeonggokgung Palace. One of the major historical sights in Seoul is the Gyeongokgun Palace, originally built in 1395. It’s now one of the most popular tourist stops and many wear traditional (or the more glittery fake traditional) Korean dresses and walk the area. The palace was a bit crowded when we went at around 4PM in the afternoon, despite it closing only a little while later at around 5:30PM. The grounds are big, and it would probably have taken at least a couple hours if we really wanted to see everything. We only went around the central are before moving on. From the palace, we walked over to Bukchon Hanok Village. Probably one of my favorite places in Seoul. It’s a historical neighborhood on a hillside near Gyeongokgun Palace that dates back to about 600 years ago. 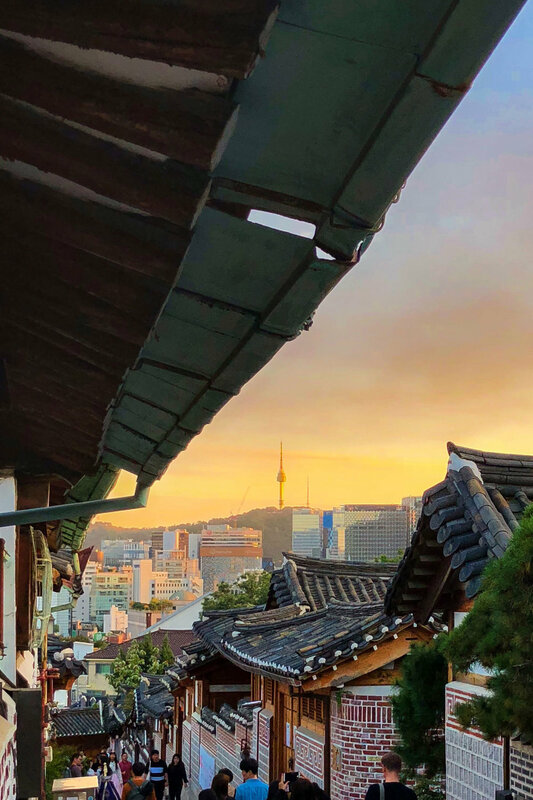 You can catch a glimpse of the city’s skyline, including Seoul Tower, from some of the alleys. The walking alleys are lined with tiled walls, and the dark rooftops add contrast to the scenery. It was quite crowded when we went, and everyone had to keep quiet as people still lived there. Historical, yes, but I loved how photogenic it was. At the bottom of the hill are a bunch of boutiques and places to eat. From Anguk station, we caught the orange line and transferred to the dark blue line at Jongno 3-ga station, before getting off at Jongno 5-ga for dinner at Jinokwha Halmae Wonjo Darkhanmari (see below). It’s only one station away from the next place we went to, the DDP. I could probably stay here all day. 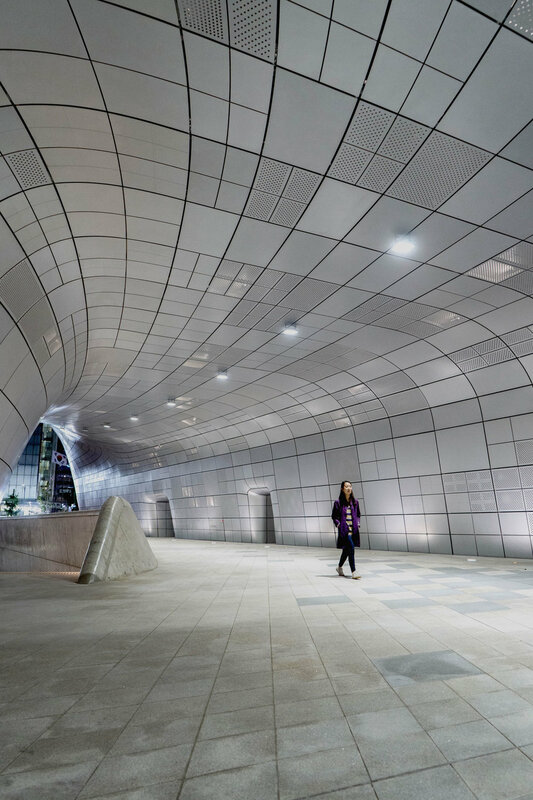 The Dongdaemun Design Plaza, or DDP, was designed by Zaha Hadid and it just about transports you to the future. Looking like a landed spaceship in the middle of shopping area Dongdaemun, the entire building almost has no corners and some of its surface tiles light up at night. The DDP has shops, exhibitions and acts as a park area to hang out. 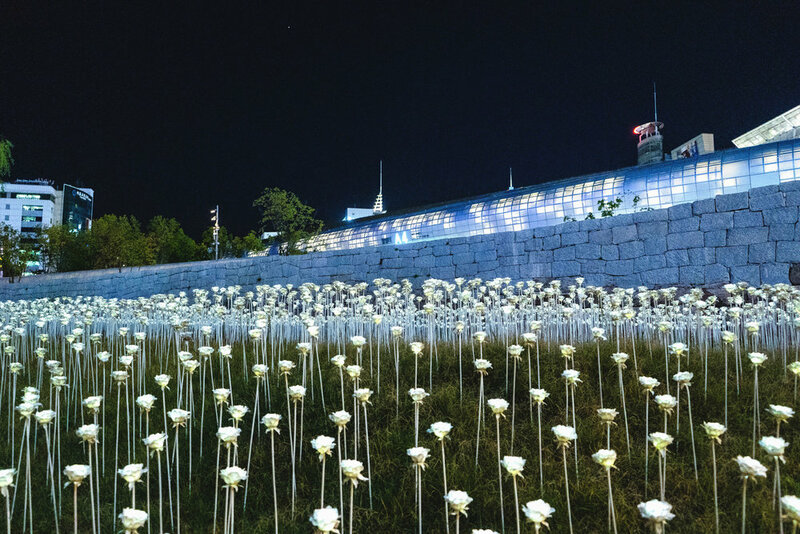 It also has an illuminated LED rose garden that’s quite beautiful at night. The building area is not only gorgeous but is also useful and clearly very well thought out - one of the most impressive sights I saw on my trip. I’d likely find myself here often if I lived in Seoul. Near Seoul station and Hoehyeon station is Namdaemun market, an open street market area with Korean snacks, clothes, food stalls and more. We grabbed a yachae hottoek - a vegetable and noodle-filled, pancake snack deep fried in soybean oil - at the famous food cart Namdaemun Yachae Hottoek [MAP] before stopping for some bibimbap in an ally full of bibimbap stalls. From Hoehyeon station, we caught the light blue line to Chungmuro, then transferred there to the orange line which took us across the river to Apgujeong station. A neighborhood in the wealthier Gangnam district, this area has a lot of shopping boutiques. The vibe is a bit different from the northern side of the river as it has more mid to high end fashion shops and upscale cafes. There were apartments by Korea’s major corporations, each with parking lots mostly full of European cars. It was no surprise when we saw a Starbucks Reserve shop here in place of the more common Hollys Coffee that’s around the city. From this area, we decided to take a taxi to the COEX mall. Taxis are pretty frequent - the orange ones are said to be the most reliable. COEX is a combined convention center / exhibition hall / shopping mall. It’s huge, and its underground shopping mall is apparently the world’s largest. One of the things it’s most known for is its Starfield Library (pictured above), a picturesque atrium area with bookshelves reaching a couple stories high. There’s also a large art installation of PSY’s “Gangnam Style hands” on the street level on its eastern side, right around here [MAP]. Catching a taxi again, we flagged one down on the street and caught it to the Lotte World Tower. I’m always looking for a nice view of whatever city I’m in, and Lotte World Tower has one of the best in Seoul. Lotte is one of the most well known Korean companies as they make everything from chewing gum to burgers. Lotte World is a huge entertainment complex with a theme park and shopping mall, and the Lotte World Tower, the tallest building in Seoul, is right there as well. The view from the tower is amazing - you can see Seoul in any direction from about 120 floors up until about 10PM. They also have a sky deck, and their elevator is a smooth, one-minute ride that features a 360-degree virtual experience while in it. Impressive. From Jamsil station next to the Lotte World Tower, we caught the green line back to the hotel before heading out to dinner at Gwangjang Market. A food stall at Gwangjang market in Seoul that serves san-nakji or “live” octopus. Another one of the major street food markets in Seoul, Gwangjang Market is known for foods such as yukke (raw beef with raw egg) and san-nakji (“live” octopus). They’re both really good. A lot of people, locals and tourists alike, come here for some street food and soju. The stall we sat at was run by one of the veterans, a lady operating in a tiny space 3ft by 3ft at best that fit the sink, refrigerator, cutting area, trash - everything. She didn’t speak any English, but her stall was very popular and she was attentive to everyone while being really hospitable. She even decided to feed me my first bites of everything, leaving me no time to question my decision to order what I did. Seoul was a great trip. There’s so much to see and service was generally pretty good. Growing up in the US, Korean restaurants aren’t known to have the friendliest service, so I was pleasantly surprised at how warm and friendly it was in Seoul. With English being often understood, a decent amount of western products being sold in stores, and Seoul being a big city but not overcrowded like Tokyo or Hong Kong, I think Seoul makes for a great trip, especially for western tourists who haven’t been to Asia before. And the food… the food is amazing. Really good oxtail soup still boiling in the pot. The seolleongtang oxtail soup st this chain was really good, and there’s unlimited kimchee at the table for your taking. Service is quick and efficient. We went around noon for lunch and there was a line - it’s quite popular and has been featured in a Korean drama - but the line moved really quickly and was totally worth it. Near the Gwangjang Market area is an ally with restaurants featuring yukke - raw beef with raw egg. You mix it together and dip it in a sesame oil sauce. It might take some time to get used to for people who’ve never had it, but it’s definitely worth it. Jamaejip had two locations next to each other and both were full when we went on a weeknight. The wait wasn’t too bad and it was a good time joining the locals for some yukke and soju. 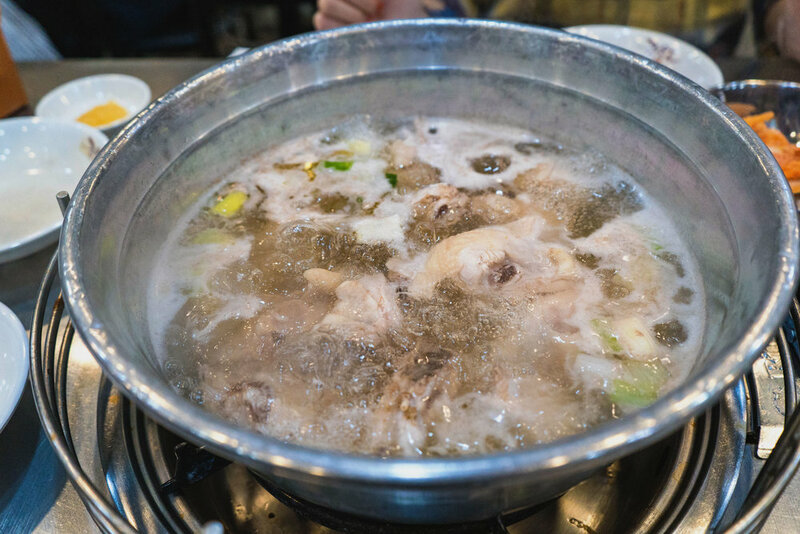 This restaurant only serves one dish: Chicken hot pot. They put a pot on your table’s burner and your chicken and vegetable Star to cook. It’s your job to mix your dipping sauce and order extras like tteokbokki if you want. While it’s so simple, it’s so good. There was a large crowd waiting to be seated outside, but with 3 floors of tables, the wait wasn’t that long at all. You could go to the neighboring restaurants serving the same thing, but you can’t lose with this place. Fried chicken and beer is a thing in Korea. I didn’t expect I’d be having something like this as a part of my Korean food experience, but I did, and wow, it was really good. There’s so much flavor in each bite, especially their spicy ones. People eat on the outside tables and drink, but we took out. Either way, delicious and recommended. A coffee shop in a traditional Korean house. We randomly stumbled upon Gallery SAI coming down from the Bukchon Hanok village and were pleasantly surprised. It’s in a converted old house that blends in with much of the area. You take your shoes off and find a table, some of which are on the floor or in a room, and have tea or coffee. A little more costly than a typical coffee shop, but well worth it for the experience.